I've always been on the lookout for the perfect scoop. I'm sure there are many of you who share my passion for ice-cream. I never really care if it's -20 or +30 degrees Celsius outside, if I have a good supply of ice-cream in my freezer, things can never go wrong. Last year I invested in an ice-cream maker and decided to take making ice-cream into my own hands. Ever since then the canister of the maker has a permanent abode in my freezer. It allows me to quickly whip up ice-cream whenever the boys and I fancy a refreshing scoop. Of course as every experiment I had some disasters in the taste department and also a few catastrophes when combining ingredients. But, there were a lot of successes too. Still, I was really excited when I discovered the release of a book made for my ice-cream maker and me. David Lebovitz' newest summer sensation The Perfect Scoop. A delicious book with ice-creams, sorbets and granitas to suit every taste bud. As if that is not enough David adds more lusciousness to the book by giving several ideas and recipes for sweet accompaniments. I know this one is going to be my summer time ice-cream Bible. I am glad that David did all the experimenting and presents me with a huge variety of recipes to try this summer. No trial and error anymore. Like with every new cookbook I get I sat down with my colored Post-its and began marking all the recipes I'd like to make straight away. When I was done I had run out of Post-its and I think I kind of marked close to every recipe in the book!! After a painstaking hour of decision making I settled on this ice-cream. Mainly because, you all know, I am a chocolate freak and wanted to officially open the summer ice-cream season with lovely and tangy raspberries. It's a combination I'd experimented with before too in a gorgeous dessert (recipe for that will be coming your way soon) and I just knew, chocolate and raspberries just work like a pair made in heaven. I "met" David during the Menu For Hope III charity, last year. David was our patron for all bloggers in Europe. Ever since then I have been reading his blog on a regular basis and learning about his escapades in Paris. I just love his sense of humor too and there is a generous helping of that in this book. The Perfect Scoop is my very first cookbook from David and I really look forward to discovering the art of ice-cream making this summer. 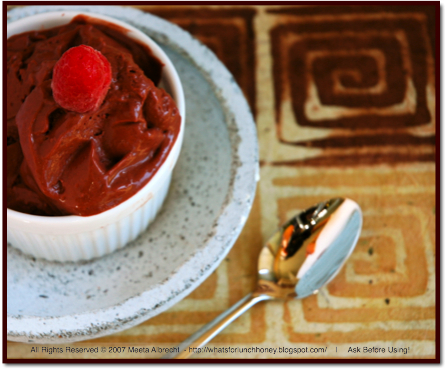 In a saucepan whisk together all the ingredients except for the raspberries. Bring the mixture to a rolling boil while whisking frequently - it will foam up and thicken. Remove from heat and add the raspberries. Cover the saucepan and set aside for approx. 10 minutes. 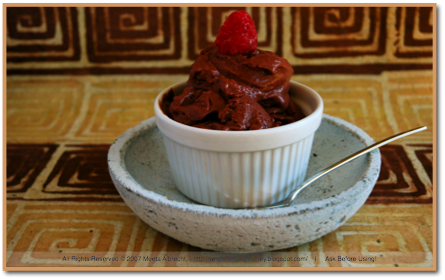 Using a pureé mixer or blender, pureé chocolate raspberry mixture. To remove the seeds press the mixture through a fine mesh sieve. If you like it crunchy then leave the seeds in the mixture. However, it tastes smoother when the seeds have been strained out, so it's worth the little extra work and I would recommend it. Place the mixture in the fridge an chill completely for 24 hours. Then according to the instructions of your ice-cream maker manufacturer, allow the mixture to churn and freeze until smooth and creamy. Mine took about 10 minutes. If your ice-cream maker requires it, you should really pre-freeze the canister of your ice-cream maker for at least 24 hours. If possible and you have enough space in the freezer, make a permanent space for it in one of the shelves. This is so important because if the canister is not properly pre-frozen you will get a mushy mixture that will resemble nothing close to ice-cream! Make sure you keep things clean and hygienic when making ice-cream. Being a diary product it is vital that you handle the equipment and ingredients with care. Wash hands and clean the parts of your ice-cream maker in hot water after every use. Cover and chill the mixture promptly. Do not have an ice-cream maker? Freeze the mixture and every half an hour or so, take it out and give it a good whisking with a hand blender. Once it is smooth, creamy and frozen it is ready to be served. Tangy and chocolaty in one lick. The dark rich chocolate was intense to the taste buds and at the back a slight tart and fruity flavor. This was rich, creamy and smooth. Each spoonful taking us to blissful ice-cream heaven. I think I am going to be finding more than just one perfect scoop with The Perfect Scoop! Hope you will join me as I discover them all! I just ordered this book - I am eagerly awaiting it's arrival!! Oh, that's one of the recipes I marked too! Oh my, if this doesn't get me in gear for kitchen spring cleaning in order to make room for my soon to be purchased ice cream maker, I don't know what will! 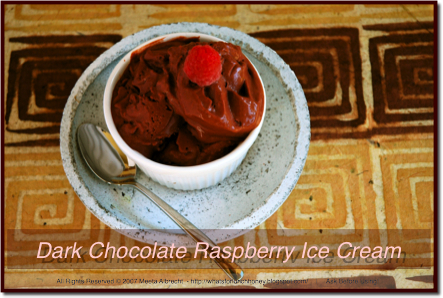 I love the color of the ice cream and the vibrant raspberry red on the side - beautiful, Meeta! As soon as I saw this book I wanted it. THat ice cream looks mouthwateringly good. And I'm with you, ice cream is not just for summer. That ice cream has such a dreamy looking texture and I can imagine how rich and dark it tastes! So good! I have been dying to catch a glimpse of this ice cream but the photo is taking a long time to load !!! I love this book....You made the most beautiful rendition of his recipe. Simply gorgeous! sound like a must-own cookbook! Meeta, your ice-cream looks gorgeous! 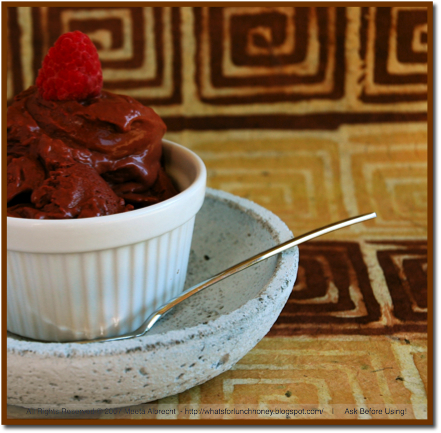 It's an ice cream festival all over the blogs! And The Perfect Scoop seems to have got all of us in a scoop! You've given me a reason to buy an ice-cream maker. Today! I have been reading and re-reading his book, although I've not had the opportunity to actually make any ice cream yet. 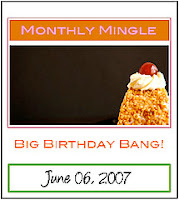 Each new recipe I see on blogs is a reminder that I need to hop to.... that is really a tempting picture! See, it's stuff like this that is why I cannot ever own an ice cream maker. I would never leave my house again, I'd be too busy making (and eating) incredible stuff like this! it took me around 3 minutes to download all the pics in ur site meeta. i am not sure if i am the only one having this prob. oh, meeta, i've been toying with the idea of an ice cream maker for a bit, now i'll have to get one. your creation is too good not to make. before that, i'll have to buy a freezer, though, 'cos mine is packed. I can have icecream anytime!! :)I had to imagine how the icecream looked as couldn't view the pics...I'm having trouble with my internet connection. Hi everyone. LOL! I hope you do not get too mad at me - neww cookbooks and ice cream makers. But honestly these are a few things you really need in your kitchen. Fro those having trouble uploading the page, I had played around with some photo settings. I was not having any trouble loading them but apparently some of you were. First thanks for letting me know and second I have changed it back to the usual setting. So, if you could give me a tip how the page is uploading now I'd appreciate it. Once again thanks for all your wondeful feedback. Oh my, that looks positively luscious!! Happy Belated birthday Fanny! Sorry I missed it but I hope it was absolutely fabulous!! Your ice cream looks stunning, such a pretty colour too. I just recieved David's book last week, and am going to make something this weekend. He is such a funny writer, and I'm loving his ice cream flavours! Looks fabulous, more the the ice cream I cannot take my eyes off the lovely pattern of the tablecloth, goes perfect with the brown colour of the icecream! That ice-cream looks heavenly. I too have the bucket from my ice-cream maker in my freezer. Unfortunately, it isn't allowed out very often. It may get a day pass during the summer! I can definitely recommend the book to you. I'll be making a lot of ice-cream this summer and hope to share them with you all. So keep those spoons ready! 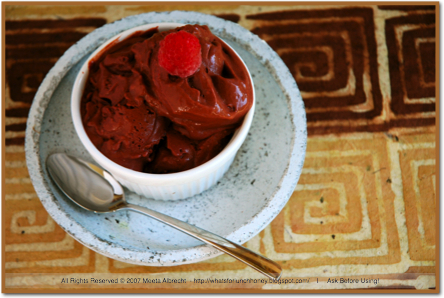 Meeta: So glad you liked the ice cream and thanks for churning up the recipe for your readers! David, nice of you to visit. I hope to be presenting a lot more of your fantastic creations all throughout summer. So, hope you check back and correct any fibs I tell ;-)!